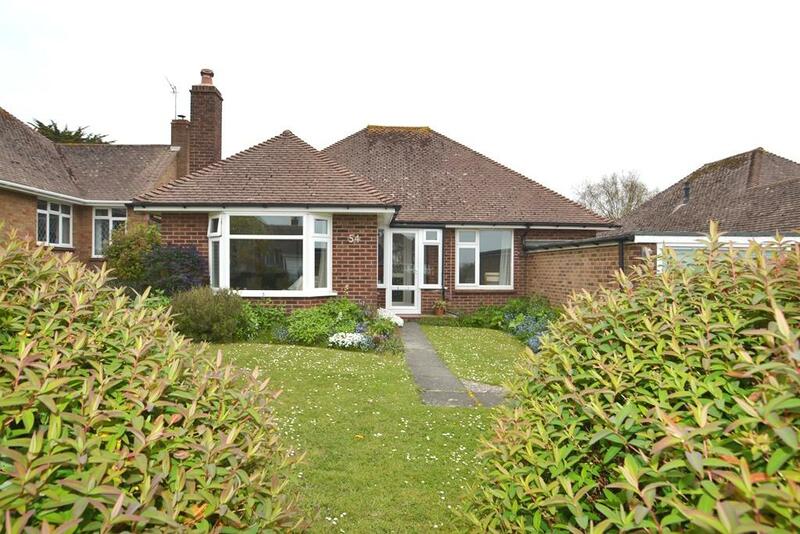 A good sized detached bungalow occupying a plot with Southerly aspected easily maintained gardens. The accommodation has been extended and comprises briefly of entrance hallway, lounge opening to dining room which has doors leading to gardens and is open plan to fitted kitchen. There are 4 good sized bedrooms, the main bedroom having en-suite facilities and a bathroom with separate WC. There is a driveway providing off street parking and leading to storage area (previously the garage). The accommodation benefits from gas central heating and double glazing. 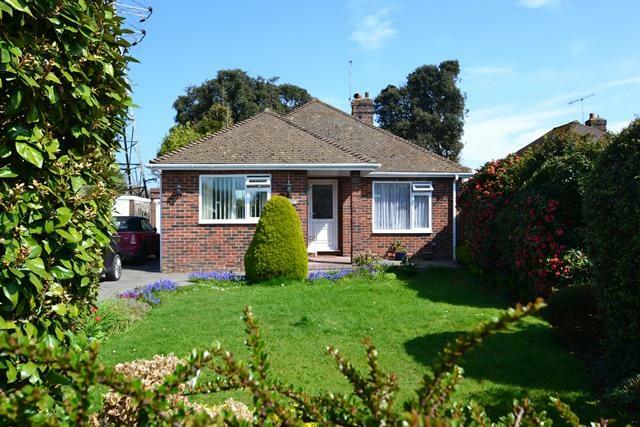 A well presented detached bungalow occupying a plot with gardens to front and rear and having drive to garage. The accommodation comprises briefly of entrance hall, cloakroom, living room, modern kitchen, dining room/bedroom 3, conservatory, two bedrooms and bathroom. The property benefits from gas heating and double glazing. A communal front door with entry phone system leads to the communal entrance with lift to the upper ground floor. A private front door leads to the entrance hall with large storage cupboard and a separate airing cupboard. A door leads to the south facing living room with radiator and French doors leading to the private south facing sun terrace. The kitchen has a range of cupboards and drawers with fitted oven & hob, dishwasher, washing machine and fridge freezer. There is also space for a small breakfast table. Bedroom one is a good size double room and benefits from built in wardrobes and French doors leading to the south facing terrace. There is a en-suite shower room with tiled walls and walk in shower cubicle, wash hand basin and close coupled WC. Bedroom two is to the rear of the property and benefits from a built in wardrobe. The family bathroom has tiled walls with a white suite comprising of a panel enclosed bath with shower over, pedestal wash hand basin and close coupled WC. Outside there is a beautiful garden to the front and a garage 2 in the well maintained compound. 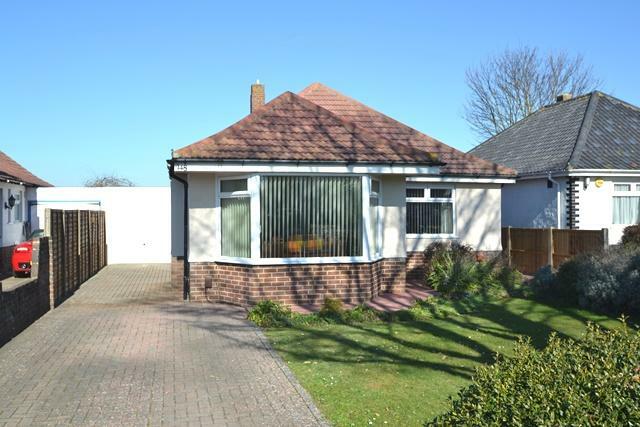 An attractive detached bungalow very close to the village centre with feature private front and rear gardens. 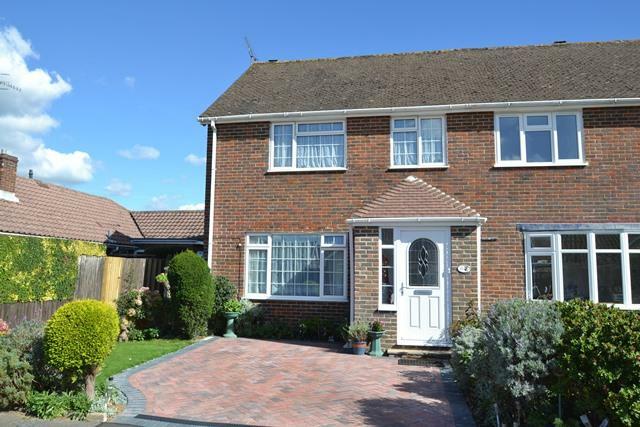 The accommodation comprises briefly of spacious entrance hallway, kitchen/breakfast room, living room leading to conservatory, three bedrooms and bathroom. 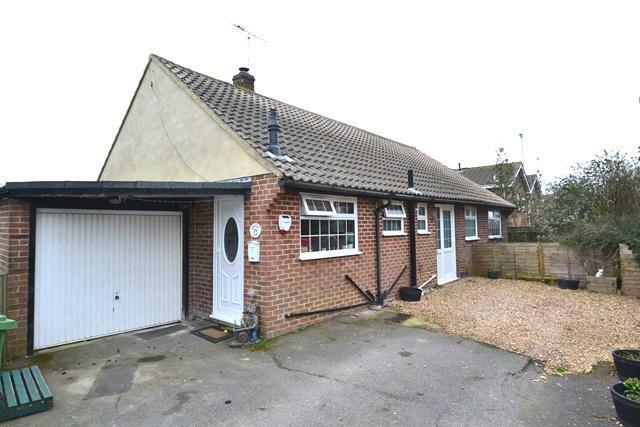 The property benefits from gas heating and double glazing and there is a driveway leading to the garage. Viewing recommended. A communal front door with entry phone system leads to the communal entrance hall. A private front door leads to the entrance hall with storage cupboard, airing cupboard and boiler cupboard. The lounge has a feature fireplace with electric fire and two sets of French doors lead to the terrace. An opening leads to the dining area with further doors out to the terrace. The kitchen benefits from a range of cupboards and drawers with integrated oven & hob, dishwasher and washing machine. To the rear of the property is bedroom one with a walk through dressing area with built in wardrobes and a door to the en-suite bathroom comprising; part tiled walls with a panel enclosed bath, pedestal wash hand basin, shower cubicle and close coupled WC. Bedroom two is also to the rear of the property and has French doors leading to a rear balcony. The property also benefits from a separate shower room with part tiled walls and a walk in shower cubicle, wash hand basin and close coupled WC. Located on the ground floor and accessed via a security key there is a resident's swimming pool with changing facilities and toilets. There is also visitors parking available as well as an under-cover private garage with electric up and over door situated in one of the garage compounds adjacent to the communal hallway. A double glazed porch leads to an inner door leading to the entrance hall with three storage cupboards and parquet flooring. The triple aspect lounge diner (formally bedroom three) benefits from a log burner, south & west facing double glazed windows and parquet flooring. The kitchen has a range of cupboards and drawers with fitted oven & gas hob with space provided for a fridge freezer and dishwasher. A door leads to the lean to / utility room with space for a washing machine and doors leading to the front and rear gardens. Bedroom one is to the rear of the property and benefits from a built in wardrobe. Bedroom two is to the front of the property and benefits from a built in wardrobe. The bathroom has part tiled walls and a white suite comprising of a panel enclosed bath with shower over, pedestal wash hand basin and WC. The property also benefits from a separate WC. Outside the front garden is laid mainly to lawn with various well stocked plant and shrub borders with a private driveway leading to the brick built garage with up & over door. The rear garden is fence enclosed with a paved area leading to lawn with mature plant and shrub borders and a personal door leading to the garage. 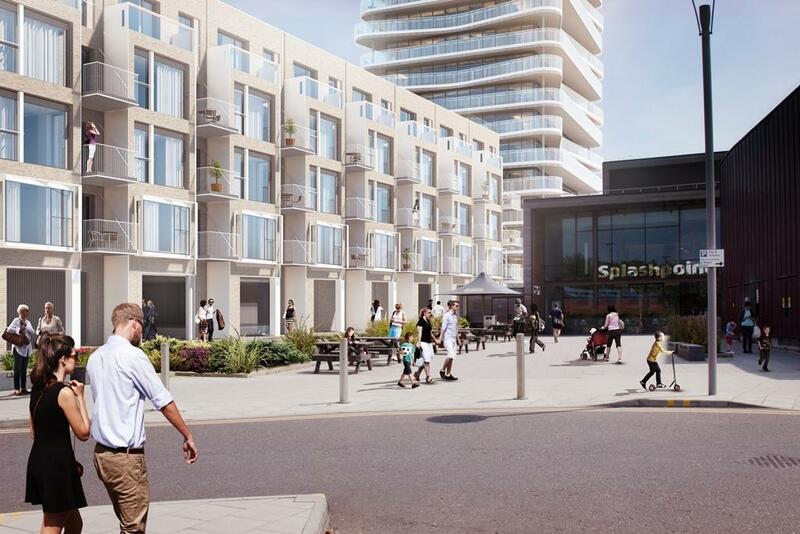 *50% RESERVED* An iconic new seafront development by Roffey Homes of 141 high quality 1,2 & 3 bedroom apartments all with either spacious balconies or outside space and private secure parking space. 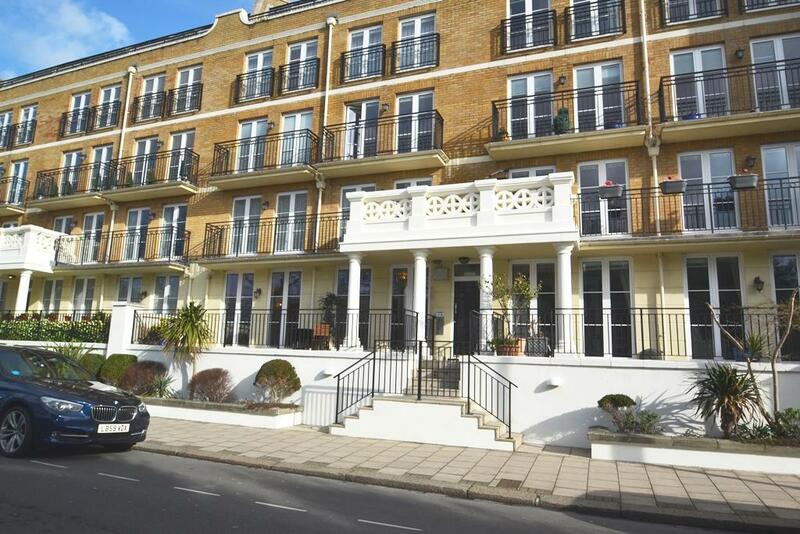 The development also features a residents private health club and new seafront square with cafe. An attractive semi-detached family house occupying a plot in a quiet residential cul-de-sac close to local shops and buses. The accommodation comprises porch, entrance hallway, kitchen, dining room, conservatory, and living room. On the first floor there are three bedrooms with a bathroom and separate WC. The rear garden is a pleasant feature of the property and there is a front garden with block paved driveway providing off street parking. The property benefits from gas heating and double glazing. Viewing recommended. A communal front door with entry phone system leads to the communal entrance and foyer. A private front door leads to the entrance hall with large airing cupboard housing hot water tank. A door leads to the lounge with wood effect flooring and double glazed door leading to the decked area. The kitchen benefits from a range of cupboards and drawers with fitted oven, hob, washing machine, dishwasher and fridge freezer. Bedroom one has a built in wardrobe and door leading to the decked area. There is also an en-suite shower room with part tiled walls and a white suite comprising of a large shower cubicle, wash hand basin and WC. Bedroom two is another double and has a window over looking the courtyard. The family bathroom has part tiled walls with a white suite comprising of a panel enclosed bath, pedestal wash hand basin and WC. 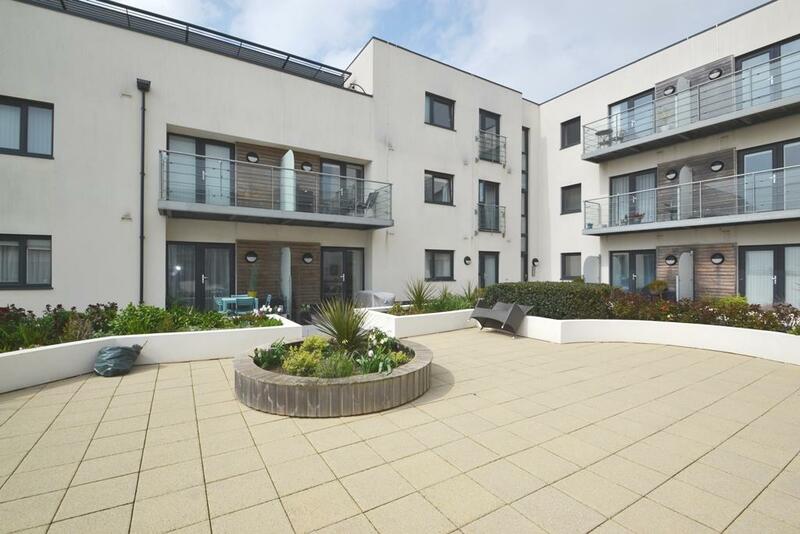 Outside the property benefits from a decked area leading to the communal courtyard with gated access to Goring beach. There is also secure underground parking with an allocated parking space. 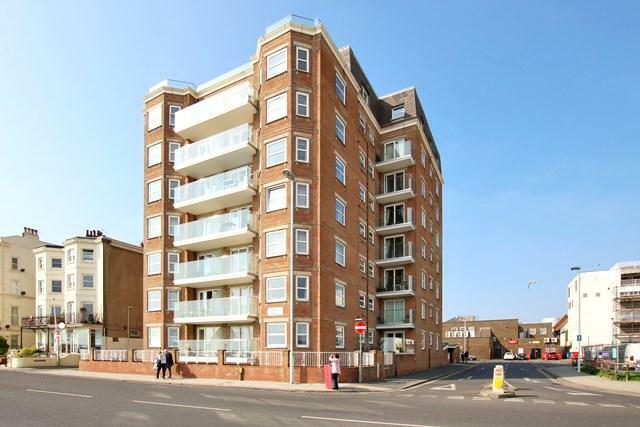 The lift or stairs gains access to the fourth floor with a private front door to the apartment. The entrance hall has a large cupboard that has been extended and there is an additional airing cupboard with washing machine. 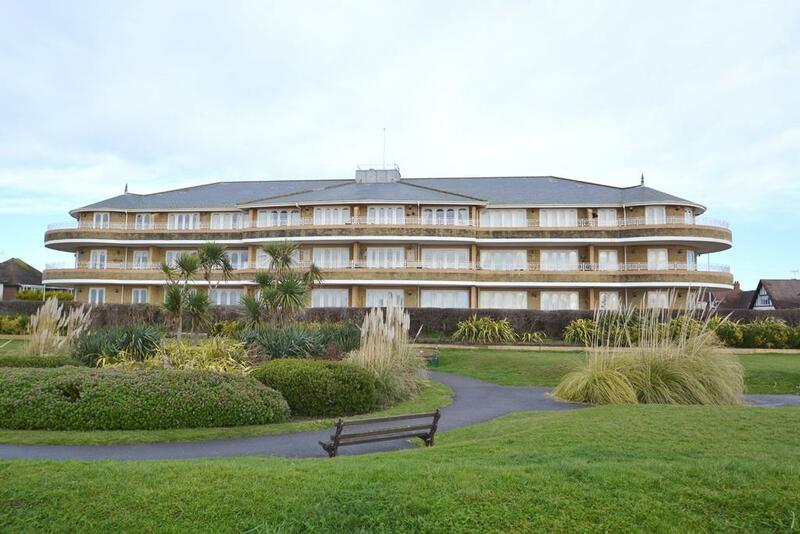 The dual aspect lounge is to the south of the property and offers uninterrupted sea views across the English Channel. There is bespoke storage cupboards in the lounge and a doorway to the modern fitted kitchen. The refitted kitchen is stylish, with matte units with space for appliances. The main bedroom is again to the south of the property and has direct access out to the balcony with views to sea and a built in wardrobe. Bedroom two is a good sized double and benefits from a built in wardrobe. There is a modern family shower room with WC. In addition to this, there is another shower room with WC and bespoke fitted cupboards. To the exterior of the property is visitors parking and bin store. The apartment benefits from its own secure underground parking space.